Cisco Systems left a lot of questions unanswered in last week's third-quarter report. A conference call and another presentation filled in the blanks. Cisco Systems (NASDAQ:CSCO) delivered a modest earnings surprise for its fiscal third quarter, but left investors guessing the reasons behind that result. Luckily -- and as expected, of course -- Cisco's management followed up that tight-lipped report with a conference call. That's where the company shared real detail on the business, including fresh guidance for the fourth quarter. And if that weren't enough, a Cisco executive then hit the stage at an industry conference just five days later, spilling even more beans on the minty-fresh quarterly results. Here's a rundown of the five most interesting things that were said in these two events. By putting the quotes into context, I'll help you figure out what Cisco's leaders were talking about. Image source: Cable Confusion by Eric, on Flickr. Cisco delivered 5% year-over-year sales growth in the third quarter alongside 6% higher adjusted earnings. Cisco delivered 5% year-over-year sales growth in the third quarter alongside 6% higher adjusted earnings. That much was known from the quarterly report, but Cisco held back on additional detail. As discussed, we continue to see the BRICs plus Mexico challenged, down 6% in total, with Russia down 41%, Brazil down 10% and China down 20%. We did see strong growth in Mexico, up 53% and India, up 6%. We are modeling the volatility in emerging markets to continue for several more quarters. To recap, Cisco is humming on almost every cylinder. There's strong growth in three out of four domestic product categories, with service provider sales being the obvious exception. Later in the call, Chambers clarified that the service provider category's sales were down 17% year over year, but if you back out the contribution from a single large telecom customer, it would be just a 6% decline. In yet another section, Chambers lingered over a large and unusual order for optical networking systems from Verizon (NYSE:VZ), so it's almost a given that the sudden ordering slowdown in this sector rests on AT&T (NYSE:T). That makes sense, of course, since AT&T CEO Randall Stephenson very publicly believes that it's impossible to invest in communications infrastructure right now. He's walking the talk, too. AT&T's trailing capital expenses have fallen 16% during the last two quarters, as regulators slapped a Title II label on broadband operations. That's one reason why Cisco's quarter could have been much better. 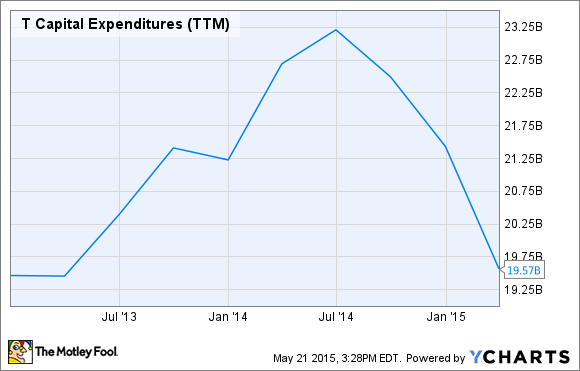 T Capital Expenditures (TTM) data by YCharts. If you look at service providers, we'll turn that back positive. The organization changes that [incoming CEO Chuck Robbins] made in the field, and the way that [chief development officer Pankaj Patel] turned the engineering [organization] sideways to focus on outcomes, literally knocking down silos over 60 business units, that now are integrated toward outcomes together -- that will turn back positive and we aren't modeling it because CapEx is going to increase. We do not think it will in the second half of the year. We think actually our share of wallet's going to change. Now let me put these pieces together. When we won the Verizon deal, people didn't get what that was. That was optical in an area that we've traditionally not been strong in. Because we organized our sales engine different, our service engines different and our R&D engine different, we understood what the customer wanted. We understood on the fly how we could realign resources. We understood how you're going to have a win rate that is much higher than ever before in markets where we haven't traditionally been as strong. All those translate into revenue growth and profit growth. Am I pumped? Oh, yes. Could I be more excited than ever to turn it over to Chuck and watch what's going to happen? I feel real good about our future. A lot of growth in revenues and a lot of growth in profits. Whoa, Nellie. That's a lot of excitement, particularly since that portion started out by explaining how Cisco is tackling a serious problem. In short, the company has revamped its entire sales and support structure for the service provider market, and already recorded at least one major win as a result. Freshly anointed CEO Chuck Robbins already played a major role in this restructuring, giving him an early taste of really running the company. Later on, Chambers made it clear that he will let Robbins hold the wheel and work the pedals. Sure, Chambers stays on as executive chairman, but promises not to become a puppet master. "Chuck is the CEO -- period," he said. "I will be his wingman." Chambers compared this budding relationship to the way Intel (NASDAQ:INTC) CEO Brian Krzanich sometimes reaches out to chairman (and industry legend) Andy Grove for strategic support. Robbins even paid a visit to Intel, to see how Krzanich manages his relationship with Grove. So you should expect a similar situation for Cisco. Will it lead to the fantastic growth that Chambers envisioned in this tiny rant? Hard to tell, but at least there's some logic to back up the emotion here. We think Cisco is very, very well-placed with solid growth in security in the quarter, 14%. And the scale of attacks are much, much greater than they've ever been. The sophistication is much, much greater than they've ever been in the past. Just to give you some data points, about 117,000 attacks a day take place on enterprises around the globe. 60% of the data is stolen within hours and if we do work within the enterprise, we find 100% of enterprises have malware and often they are not aware of it. So the fragmentation of the security market historically we think provides a great opportunity for us and the network we believe is the best platform to deliver on security. Those are scary statistics for anyone with a role in network security and operations. Every single enterprise customer has turned up malware infections in Cisco's studies, and they often don't even know about it. Cisco can offer security solutions in and around corporate networks, starting with attack shields in the so-called edge routers. In the earnings call, Chambers noted that Cisco is the largest provider of these edge security solutions, but with just a 7% market share in a brutally fragmented market. The company hopes to capture a 40% share over time, but it will be a difficult multiyear slog. We expect total revenue to be in the range of 1% to 3% growth on a year-over-year basis. For the fourth quarter we anticipate non-GAAP gross margin to be in the range of 61% to 62%. As we have said in the past, forecasting non-GAAP gross margin has always been challenging due to various factors such as volume, product mix, cost savings and pricing. As a reminder, non-GAAP gross margin may vary quarter to quarter by one point in either direction of our guidance range. Our non-GAAP operating margin in Q 4 is expected to be in the range of 27.5% to 28.5%. Our non-GAAP tax provision rate is expected to be approximately 22% in the fourth quarter. Our Q4 non-GAAP earnings per share is expected to range from $0.55 to $0.57. We anticipate our GAAP earnings to be lower than our non-GAAP EPS by $0.10 to $0.13 per share in Q 4 2015. The range includes a pre-tax charge of approximately $100 million as a result of the restructuring actions that we announced in the first quarter. To recap, these guidance ranges center on adjusted earnings of $0.56 per share and sales near $12.6 billion. Both figures were exactly in line with prevailing estimates. In other words, those dramatic growth drivers that Chambers talked about will have to wait a while. Rome wasn't built in a day, right? Neither was San Francisco. Cisco CEO John Chambers. Image source: Cisco. Competitors selling low cost technology building blocks can't compete with our total cost advantage, operational efficiency, security, and speed to results that Cisco provides. And when there is an issue, we have all seen the nightmare of trying to identify where and who to call translate into billions in lost business and reputational damages. If you think you've seen this idea before, you're probably reminded of the old IBM (NYSE:IBM) model. Even as IBM is moving away from its iconic one-stop-shopping model, Cisco steps in to take it over. There was a time when every tech giant seemed hellbent on copying the IBM idea, but they've been dropping like flies. IBM itself is becoming more of a pure play on software and services, Hewlett-Packard (NYSE:HPQ) is about to split in two and redefine its entire business model. Cisco is the most credible "IBM 2.0" alternative left standing, though Oracle (NYSE:ORCL) hasn't entirely given up the fight. Cisco's big idea is that this is where you go when you need one vendor to create a data center -- integrated from end to end. I'm not entirely sure that customers will buy that logic, at least not on the scale that Chambers envisions. Single-source solutions can be powerful and convenient, but you can say the same about picking best-of-breed products for every piece of the puzzle. So the jury is still out on Cisco's grand vision. The company still gets credit for having that big dream... and an outside shot at achieving it.